There are a ton of jalapenos to be used up from my recent garden harvest. One of my favorite ways to use the jalapenos is in my daughter, Naomi’s roasted salsa. My daughter got me hooked on her salsa the first time I tasted it, and being the “spice weenie” that I am it’s amazing that I liked it at all. She roasts fresh veggies, and throws everything in the food processor for a yummy, yummy treat. This recipe has become a family favorite for all of our family get togethers. Now here’s what you need to do to make it. 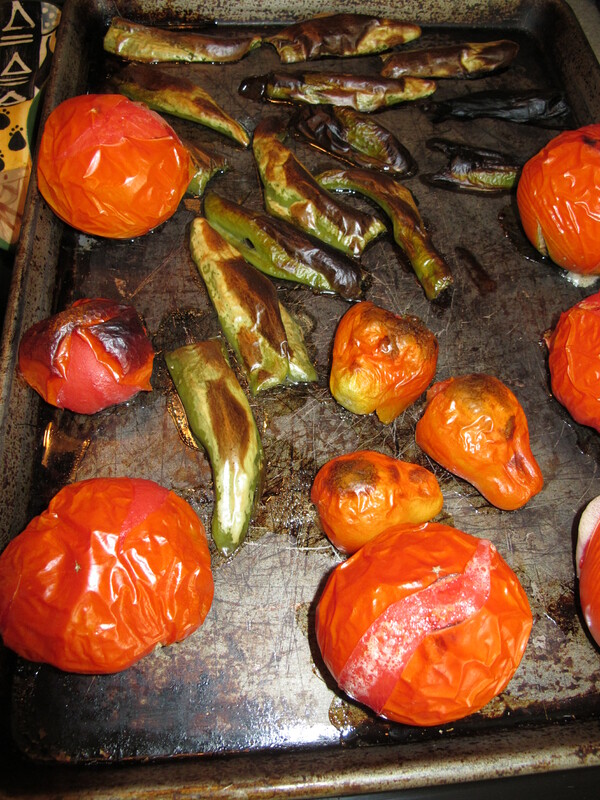 * Note – for a milder salsa clean the seeds from the jalapeño, and slice in half before roasting. 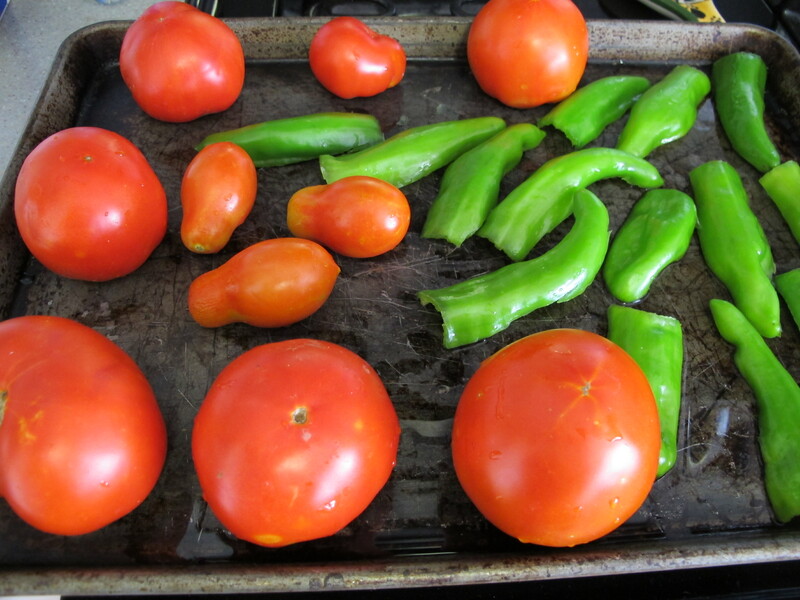 1) Rinse your veggies, and toss them on a big cookie sheet. The jalapenos are de-seeded and sliced in half for my roasting purposes. Since I’m the spice weenie. I don’t want the heat. 2) Pre-heat your oven to 350 degrees and bake for 15 minutes. 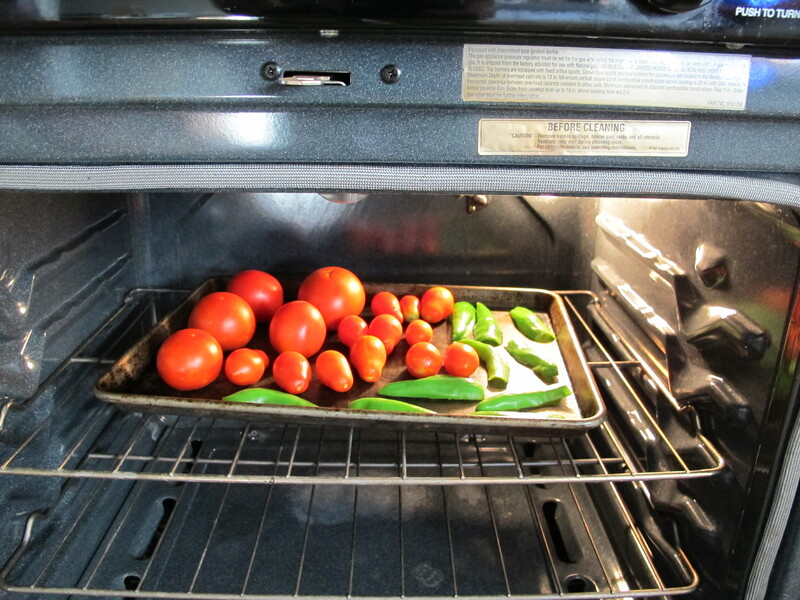 3) Then turn your oven to broil, and cook the veggies for an additional 10 minutes. 4) After the veggies are cooked, cool them in the fridge overnite, or for at least 6 hours. 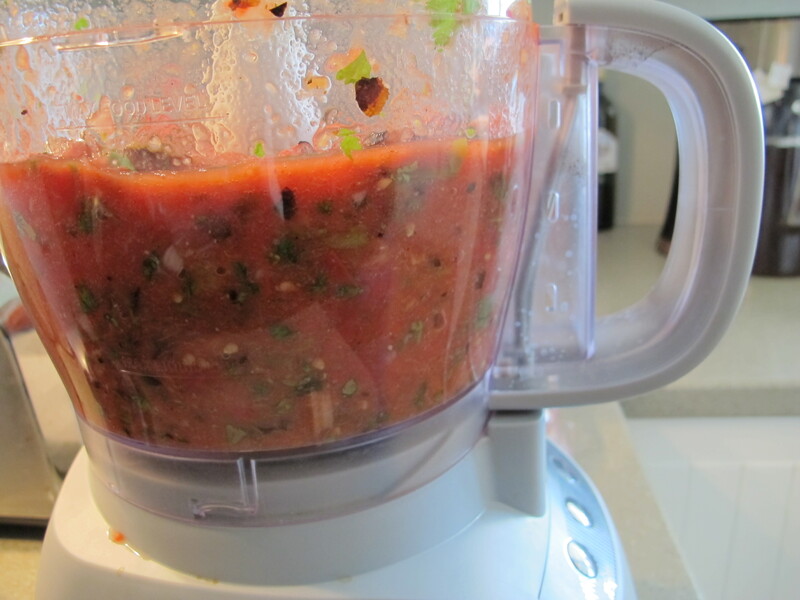 5) To put the salsa together pull out your favorite food processor. 6) Put the onion in the food processor in quarters, and chop until very fine. 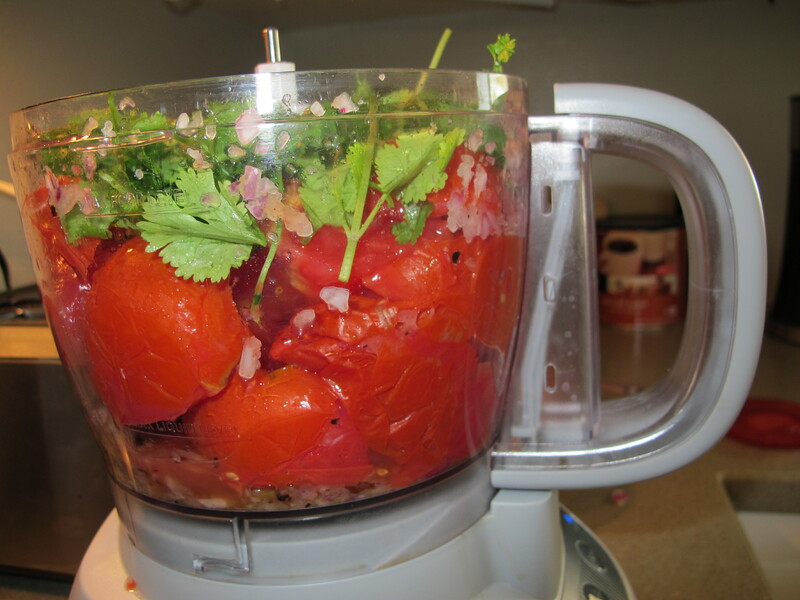 7) Cut the center from the tomatoes, and either quarter them or cut them in half for smoother processing. 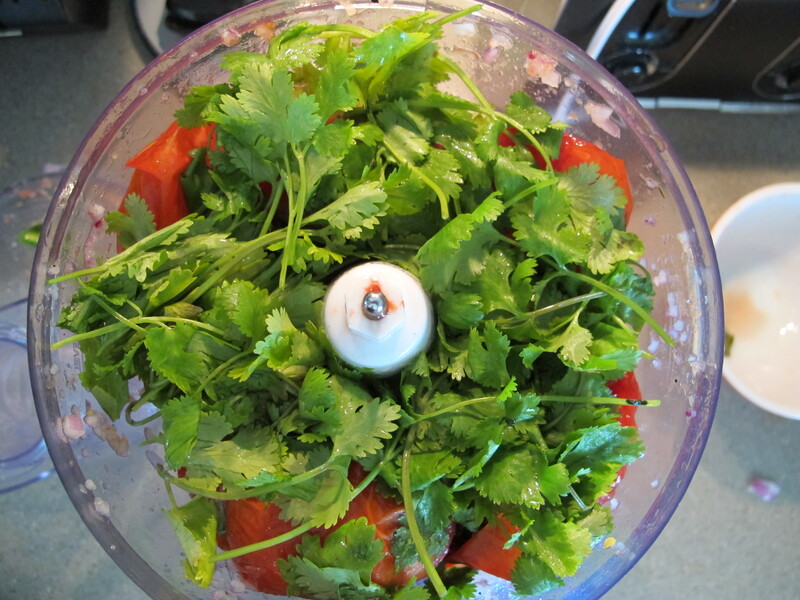 8) Place the remaining ingredients in the food processor, and pulse only for a thicker, chunkier salsa. 9) I pulse for just a few seconds and then check the consistency before pulsing again. This is consistency that I like to have for my salsa. Can you see the little bits of roasted jalapeno? This gives the salsa such great flavor. Yum! 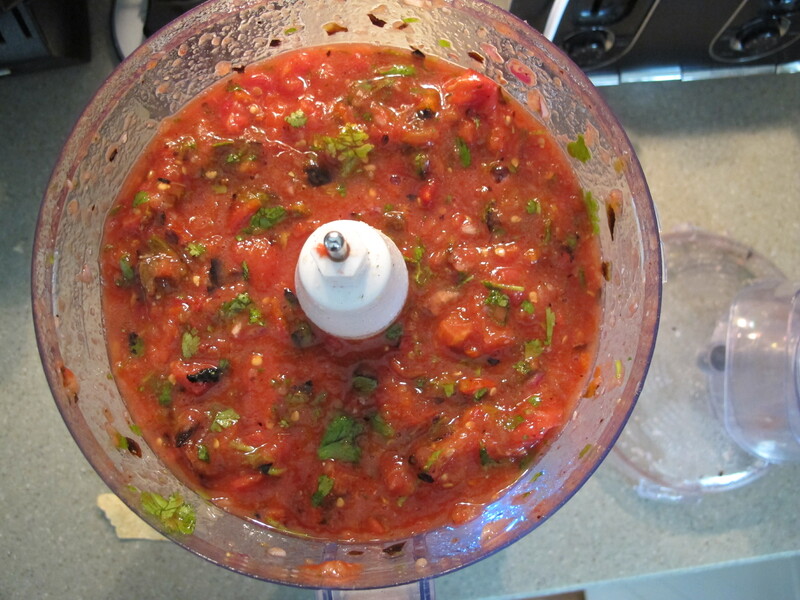 10) This next item is very important in the salsa process. Get your favorite tortilla chips out of the cupboard, and taste test the salsa to be sure you have enough garlic salt, and the heat is the way you like it. You can also designate an official taste tester, but I prefer to do my own tasting. 11) I only like my salsa very mild (the spice weenie effect), so these directions don’t include a lot of ingredients for the heat. If you want or like the extra heat; leave the seeds in the jalapenos, and add additional el pato sauce. This is a wonderful fresh salsa. You can use it in your favorite guacamole recipe, as a garnish on tacos or burritos. The sky is the limit. 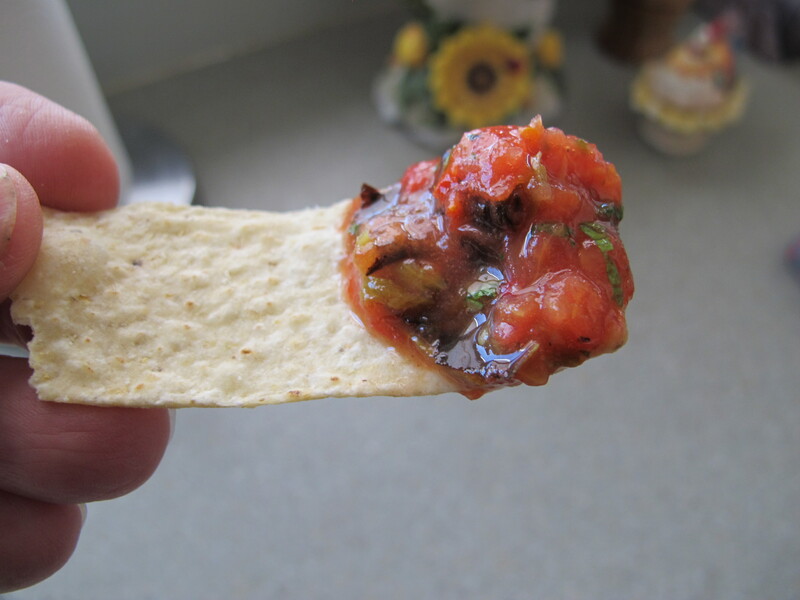 If you enjoy the roasted veggie flavor this is a great staple salsa that you can make all on your own. I’m off to the kitchen to make my next batch. Have a great weekend everyone.